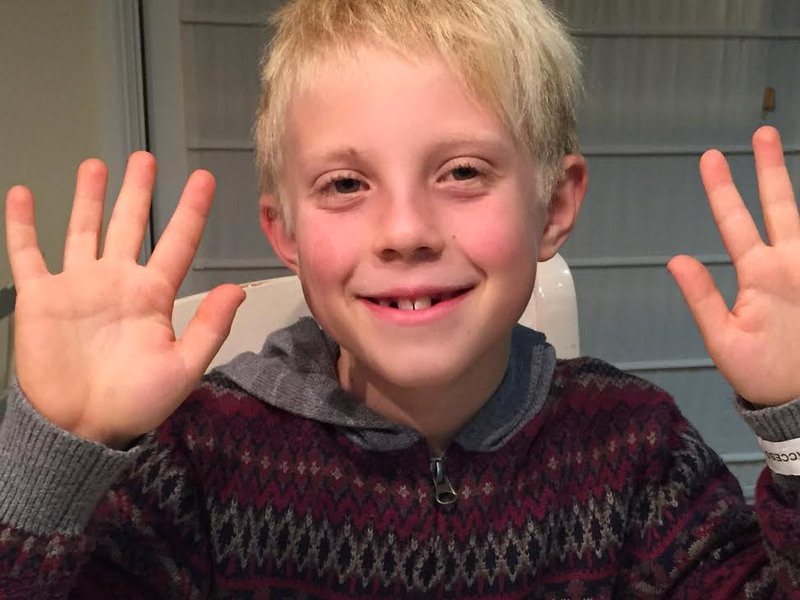 Watch this video to hear about my exciting interview for ABC News! “Mom, when are they gonna get there?” I asked, wondering about the tv news people. “Very soon, sweetie” said my mom. “Would you like a tour of the back of the restaurant” said a voice behind me. The man who took me in the back of the restaurant said his name was Kevin and he was the owner of the restaurant, Rosti. Kevin showed me all the different parts of the kitchen and introduced me to the people who worked there. Kevin even showed me a walk-in refrigerator! Cool! (Do you get the joke?) 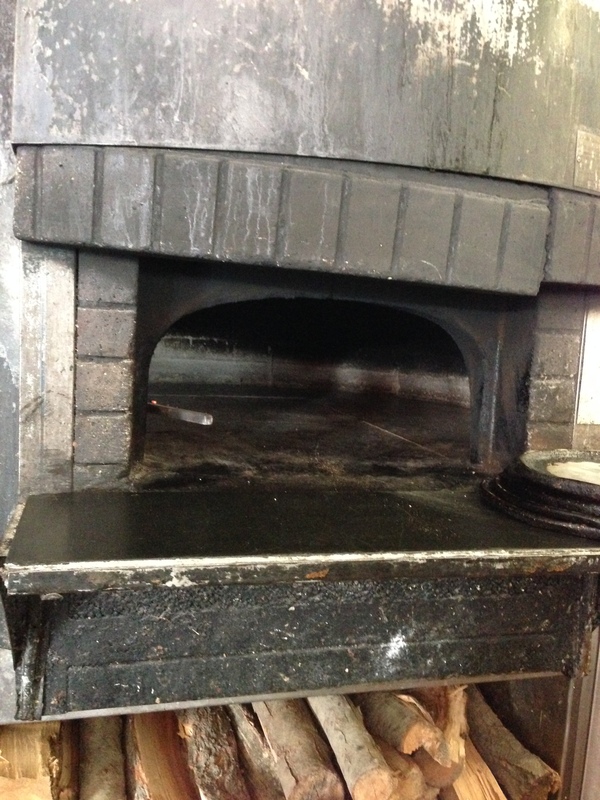 I also saw a wood fire oven that they use to make pizzas. Just then Lori Corbin and her camera man Dave walked into the restaurant. Lori is the food and fitness coach for ABC News! She was there to interview me!! As soon as she walked in my tummy got very nervous. They sat us down at a table and Lori gave me a teeny tiny microphone that was the size of a peanut and clipped it on to my tie. While Dave was getting set up with the camera, Kevin walked over and asked me what I wanted to order. 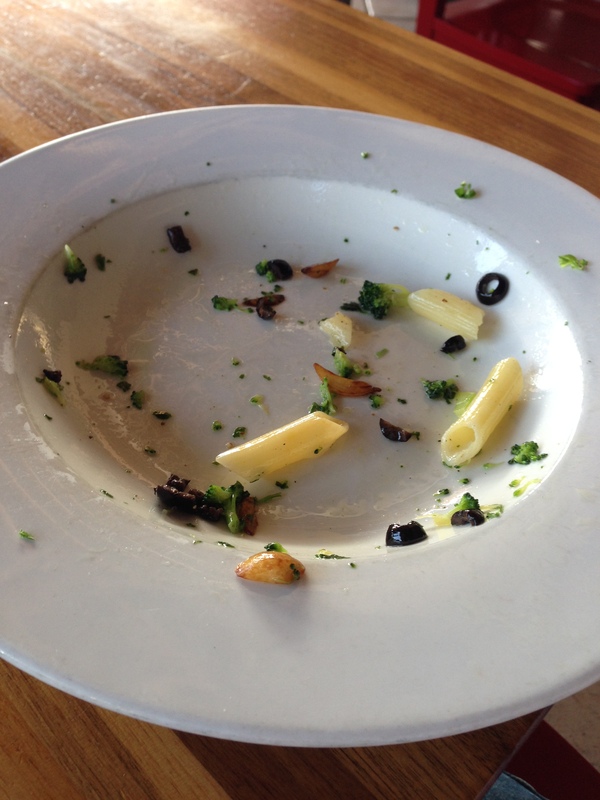 I ordered gluten free penne with olives and broccoli in an olive oil and garlic sauce — of course! When Dave was ready to go, Lori started asking me questions like “how did you start your blog?” and “why are you doing this?” I don’t want to give away too much because when the interview comes out on television I will show you the video of it. But I can tell you that it was a really good day! Five minutes later I could see my food on the counter and I was hungry! Kevin brought it over and I told my mom it was as good as burritos, which you know is my favorite food. My broccoli was very crunchy and the roasted garlic was the best. The pasta was not mushy at all. In fact it was just right. I started eating it so fast that we forgot to take a picture of the full plate! I thought the service was really good. Kevin was being really nice to me. He even offered me the chance to share my own ideas about things he could add to the menu. I even got his business card and I might go back and interview him one day. Finally, I finished my pasta. This is how much I loved it! That is so exciting! You are making such an impact. Keep up the great writing. I look forward to reading the next one and seeing your interview. You taught me how to write well! Great post Max! I got the joke! Fridge, cool. Good one… The other good thing about Rosti is they have a gluten free and vegetarian menu with many options for people. And their going to update more! Way cool, Max! Please link us to the interview when it airs.